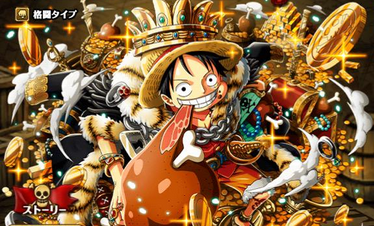 OPTC Guideblog: Log Luffy VERSUS the rest!! Enter the newest 6-Star in the Game!! And... He's a fighter!!! No surprise there. Monkey D. Luffy now holds the highest ATK stat amongst the collection of 6-Stars. And like all 6-Stars, Monkey D. Luffy has a nice mix of stats with well over 3,000 health and the monstrous 1,430 ATK (still losing to Arlong). There are definitely no complaints as expected. Unbelievably similar to Monkey D. Luffy: Gear 3. In fact... even the damage is extremely similar. There are many versions of the "damage tables" and comparisons running around the place. But here's one that we've been working on. This damage table does not represent every team nor is it a practical demonstration of which team deals more damage. It is simply directly comparing Captain Skill without regard to crew-members. In most practical cases, "Log Luffy" will have the upper-hand strictly due to the fact that the later 3 attacks will overpower the initial 3 attacks. But as you can see, there isn't a significant difference in the Captain Skill's total damage. Since the damage will generally be similar to Gear 3, the damage output of the team is significant enough to dent/kill everything that Gear 3 can (which is a lot of things). So it comes down to the requirements, which depends on the individual taste of the player. If a player finds hitting 3x PERFECTs too stressful, they could switch to Log Luffy. If they find it difficult to consistently hit GOODs/GREATs, then maybe they should stick with Gear 3. In either case, messing up a combo will ruin your team's damage and will be extremely punishing to your damage. However! There is one more thing you need to consider about Log Luffy. The thing so precious that makes Gear 3 Players drool... The ability to use [Meat] Orbs. Since you are hitting GOODs and GREATs, you can actually consume [Meat] orbs to heal pre-emptive damage. Which essentially alone could put Log Luffy over the top. So essentially - Log Luffy is extremely similar to Gear 3 Luffy. If we are just considering the Captain Skill's damage output, nobody would argue with whichever you choose to go with. The Special is where Log Luffy really stands out from Gear 3. Log Luffy's special does "Large" random non-attribute damage to all enemies as well as changing his own orb to [STR] on a 23-turn cooldown. The "Large" random damage has been capable of dealing anywhere from 70,000 to 200,000 damage (approximately) from units like Sengoku. This is significantly better than Gear 3's Special and is enough to chunk a portion of most Raid Boss' health. Similar to how Sengoku had another effect tagged with his damage, Luffy can change his orb to [STR]. This is fairly significant on Luffy compared to other units with similar Specials (like Kid or Jimbei). This is because Luffy deals most damage on the last hit, so having a guaranteed orb is important to ensure maximum damage output. Putting the two parts of his special together, we can see that Luffy has an incredibly powerful special that really sets him apart from Gear 3. It comes at a decently short cooldown of 23 turns (which will grow shorter when his skill books are released to possibly 20 cooldown). Log Luffy is considered by many as an upgrade of the famous Gear 3. It's time to retire our old friend and bring in a fresh face. This Luffy is worthy of his 6-Star spot and will end up battling Rayleigh for the top "Combo-based" team lead.